Castel Cellesi is a little jewel really unknown to most of the world. Being in Castel Cellesi is like stepping back in time. What makes Castel Cellesi so different? The most important factor is that the road to Castel Cellesi ends here. There is no through road €" this means that the world has mostly passed the village by. It is quiet, safe and unspoilt. 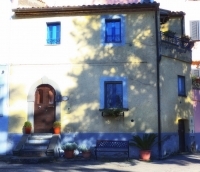 Casa Angolo Cristina is a two roomed house, just behind the main piazza of the village. Upstairs large tastefully decorated double bedroom and bathroom. Downstairs, a further bathroom, kitchen and living area with double sofa bed. TV. Air conditioning. Shared use of swimming pool.